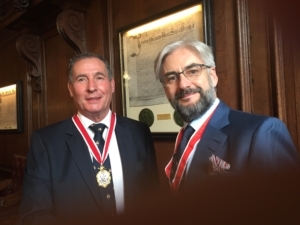 Michael Bunn, the Principal of the accountancy business MB Associates, was elected Chairman of the Ward of Cordwainer Club at the Club’s AGM at Tallow Chandlers’ Hall on 29 March. He succeeds David Tucker. David Reynolds is the new Vice Chairman and Sue Hills joins the Committee. Sir Mark Boleat automatically ceased to be a member of the Committee on resigning as a Common Councilman on 14 March. His successor, to be elected at the end of April, with join the Committee as an ex officio member. Jon Norton has taken on the role of Treasurer, succeeding Tom Hoffman, who held the position for some 30 Years. Following the AGM the guest speaker at the lunch was Simon Bishop, Deputy CEO of Plan International, the global children’s charity.